The date on the front page of the report reads August 2007 and yet it was only published last week. It's reasonable to ask why? The answer is that H&F Council have spent the last half year unsuccessfully arguing against the Audit Commission’s latest conclusions which detail how the borough has fallen from an elite 4 score to a second rated 3 score local authority. Not that any member of the public would know. The result was met with a fresh wave of tax-payer-funded publicity trumpeting H&F Council’s previous overall rating - mostly achieved under the last Labour Administration. This news follows on from the shock announcement that the Audit Commission has recently graded H&F Council’s housing management service as “poor” giving it only 1 star and assessing it as having “uncertain prospects for improvement”. That's one star more than the Housing Quality Network rated the service when it carried out a comprehensive assessment last summer and concluded that the service was only due a failing "zero" star rating. The Council has also recently met with the Audit Commission about this judgement which I understand it is tenaciously lobbying to have overturned. 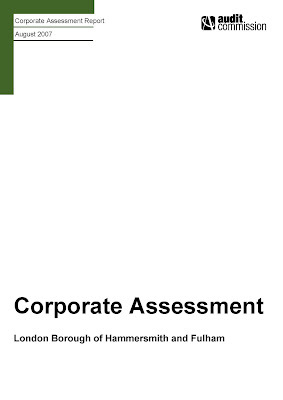 Please email me here if you would like to see a copy of H&F Council’s latest Audit Commission Corporate Assessment Report. I’ll send it to you in PDF format by return.